Paul Andrew Mayewski Institute for Quaternary and Climate Studies University of Maine On behalf of the 2001-2002 US ITASE traverse team. 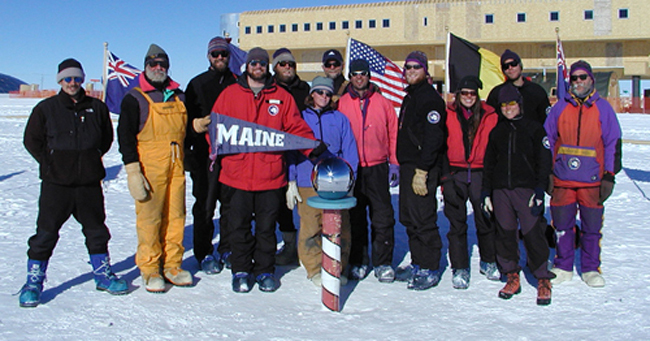 During the fourth US ITASE season (2002-2003) the field team traversed 1250 km from Byrd to South Pole. The traverse was comprised of 13 members, two Challenger 55s, and various heavy and light sleds. The bulk of the AN8 fuel used by the Challengers was air dropped to four sites along the route. Route selection was based upon the science objectives of the US ITASE researchers and safe route selection was aided by examination of RADARSAT images and an onboard crevasse detection system. Eleven, integrated science programs were supported by US ITASE in 2002-2003. Science was conducted both during travel and at eight sites. Continuous shallow (~120 m) and deep (>3000m) radar, high precision kinematic GPS, and surface snow sampling comprised the travel component of the science. Near real-time shallow radar information was used to finely tune the location of study sites and to tie these sites together via identification of long distance subsurface marker horizons. At each site 3” and 2” diameter ice cores were collected that will provide samples for stable isotopes, major soluble ions, water soluble trace gases, trace elements, organic acids, ? activity, stratigraphy, porosity, permeability, and density. 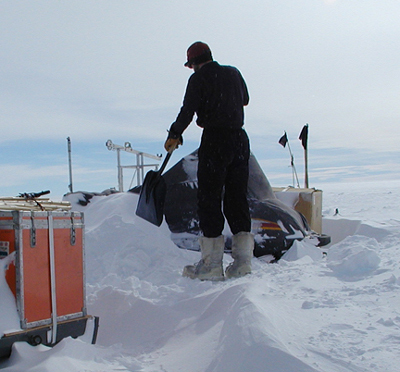 A total of 920 m of ice core was collected. Atmospheric sampling of surface air and air to a height of 23 km was conducted as well as high precision GPS surveys to determine mass balance, ice flow direction and speeds, and ice surface topography. US ITASE offers the ground-based opportunities of traditional style traverse travel coupled with the modern technology of satellite image route selection, GPS navigation, crevasse detecting radar, satellite communications and multi-disciplinary research. By operating as an oversnow traverse US ITASE offers scientists the opportunity to experience the dynamic range of the Antarctic environment. US ITASE also offers an important interactive venue for research (currently eleven integrated science projects) similar to that afforded by oceanographic research vessels and large polar field camps, without the cost of the former or the lack of mobility of the latter. More importantly, the combination of disciplines represented by US ITASE provides a unique, multi-dimensional (x, y, z and time) view of the ice sheet and its history. Over the past four field seasons (1999-2003) US ITASE sampled the environment of West Antarctica into East Antarctica over spatial scales of >5000 km, depths of >3000 m, heights in the atmosphere of >20 km, and time periods of several hundred years (sub-annual scale) to hundreds of thousands of years (millennial scale). (11) two LC-130 fuel drops were made early in the season to provide AN8 fuel for the traverse. 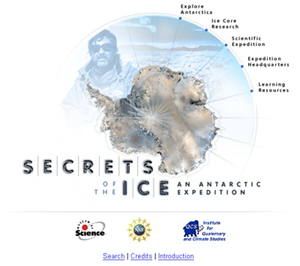 The traverse route planned for 2002-2003 extended 1250 km from Byrd Surface Camp to South Pole. 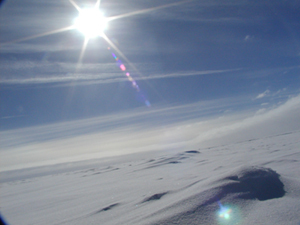 The traverse team arrived at Byrd on 20 November – five days behind schedule due to weather in McMurdo and Byrd. The Byrd put-in crew (Lynn Peters, Carl Hess, Andrea Isgro plus other Raytheon staff) arrived at Byrd 28 October. Fuel was air dropped along the traverse route several days prior to 31 October. (1) Deeper snow than anything encountered during previous ITASE and ITASE related traverses (1994-95, 1999-00, 2000-01, 2001-02). We assume the increased snowfall was related to the impact of the 2002-03 El Nino on West Antarctica. (2) Loss of the Aalaner sled used as a fuel sled in 2000-01 and 2001-02. 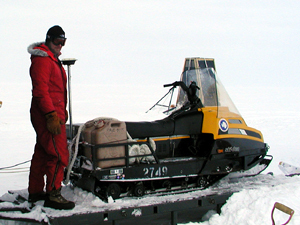 We attempted to use a Berco sled in lieu of the Aalaner shipped back to Scott Base at the end of the 2001-02 season. (3) Lack of wide tracks on the older Challenger 55. The narrow tracks that functioned adequately during 2000-01 and 2001-02 were insufficient for the deeper snow encountered in 2002-03. After discussion with McMurdo we returned to Byrd. Several alternatives were suggested: completing only part of the planned traverse, shuttling lighter loads, limiting science objectives, and waiting at Byrd for the Aalaner fuel sled and a set of Challenger 55 wide tracks. We were advised that every attempt would be made to provide us with both the Aalaner and the wide tracks. The Aalaner and wide tracks arrived at Byrd 5 December. By 6 December the wide tracks were mounted (in just several hours) and the Aalaner loaded with fuel. The traverse departed that day for Site 1. Travel to this site averaged ~5km/hour as a consequence of soft snow. From Site 1 to Site 3 travel remained relatively slow due to soft patches, sometimes necessitating pulling a single train by two Challengers in tandem. Adjustments to sled loads and configurations gradually improved travel. Unfortunately the only sled available for carrying empty fuel barrels was needed to carry scientific equipment and the atmospheric sampling set-up was off-loaded from Zebrowski sleds that acted like snow anchors. After traversing the transition from West to East Antarctica through the Bottleneck travel on the East Antarctic Plateau improved until ~100km from South Pole where deep (12”+) snow forced us to ferry loads to South Pole. (1) Two Challenger 55s traversed a total of 1250 km on the main traverse and ~500 km on day trips. (2) Continuous radar observations (crevasse detection (400 MHz) and shallow depth (400 MHz) were made over the 1250 km of the main traverse route. Deep (2.5 MHz) radar was conducted over all but 166 km of the full 1250 km and over ~200 km of day trips. High precision kinematic GPS data were collected in tandem with the radar profiling along the entire traverse route. (3) Five original science sites were occupied for periods of 2-3 days, plus work at Byrd conducted during the wait for the Aalaner and wide tracks, plus one reconnaissance site in preparation for phase two of US ITASE. A total of 920 m of ice cores were recovered utilizing both the 3” diameter Eclipse drill purchased by NSF for use by US ITASE and a 2.2” diameter lightweight drill built by Glacier Data for the University of Maine. Analyses to be conducted on these cores include: stable isotopes, major ion chemistry, trace and reversible species chemistry, beta activity, stratigraphy, porosity, and permeability. (4) Atmospheric and shallow chemistry observations were conducted at eight sites for periods of 24-48 hours. This sampling included real-time, continuous observations of peroxides (H2O2 and organic peroxides), formaldehyde and ozone near surface and ozone profiles up to an altitude of ~20 km. 2”-cores ( total length 38 m) from 7 sites were analyzed for H2O2 and HCHO on site using a continuous flow analysis melter system. The seasonal signal of H2O2 provided an on site estimate of the mean annual accumulation over the past 10-15 yr and was used along with stratigraphic determination of annual accumulation as an orientation for the minimum drilling depth. (5) Basic meteorological observations were collected at all sites and 10 m depth temperatures for comparison with infrared satellite estimates of mean annual temperature. (6) Five high precision GPS ‘coffee can’ experiments were deployed (Sites 1-5) to calculate mass balance and the distribution of basal sliding motion. (7) High precision GPS mapping was conducted at Byrd and Site 3 as validation for NASA’s ICESat experiment. The information presented below does not guarantee perfect US ITASE seasons in the future, however, it is intended to be an important step in the evolution of research style oversnow traverse capability. Several discussion items follow. They represent the combined thoughts of the members of the US ITASE 2002-03 traverse. They are offered as a starting point for discussions with OPP/NSF and Raytheon concerning future US ITASE activities. US ITASE operated with two Challenger 55s during 2002-2003. Each vehicle pulled between 30,000 and 45,000 lbs. The vehicles performed very well once both were equipped with wide tracks. Only routine maintenance was required. (1) One mechanic’s position should be maintained for each heavy vehicle. (2) The older Challenger should be fitted with a rear winch and cable, heavy-duty hitch, and counter weights similar to the newer Challenger as requested in our 2001-02 field report. (3) As requested in our 2001-02 report blockage problems for engine screens in freezing fog and diamond dust conditions should be investigated to prevent overheating and 1-3 km frequency stops to clear screens in fog conditions. This may be resolved through the addition of pusher fans or reversible fans. (4) The older Challenger has a 60” wide axle (including spacers) and the newer Challenger has an 80” wide axle. The newer Challenger negotiated turns far more easily (by 100s of m) when pulling sleds than the older Challenger. The reduced turning capacity of the older Challenger resulted in the train bogging down several times. Further the wider axle Challenger cut a path outside that of following Berco sleds allowing the latter to cut through untouched snow, reducing ground clearance problems. Four Berco sleds (3000 lbs each) and one Aalaner sled (6000 lbs) were used during the 2001-2002 season. The Aalaner was replaced by another Berco for the onset of the 2002-03 season. A replacement Aalaner or equivalent fuel sled was requested in the 2001-02 field report. The Aalaner request was based on the success of using this sled in two previous seasons. However, because the Aalaner was already on extended loan from Scott Base it was returned to Scott Base at the end of the 2001-02 season. We were informed that it would be replaced by a Berco. (1) Berco 1 (“Blue Room”) served as a science facility (warm space for computers and wet chemistry preparation) plus berthing for up to 9 people. The Blue Room has a solar/wind powered system with a bank of 10 batteries. Shallow radar and kinematic GPS profiling was carried out in this structure during the travel legs. (2) Berco 2 afforded kitchen space. Seating for 14-15 is possible during special dinners, and up to 10 “comfortably” on a routine basis. The kitchen also offered berthing for 4 people. The kitchen has a solar/wind powered 24 volt system with a bank of 10 batteries (although the 24 V inverter failed mid season and was replaced with a spare 12 V system). (3) Berco 3 was fitted at Byrd with a Weather Haven. It provided space for work on mechanical, ice coring, and radar equipment, berthing for 4 people, and overflow space for dining. (4) Berco 4 provided space for ice core boxes plus food stores. (5) Berco 5 was originally intended to carry fuel drums. It sank to its axles on the first attempt to Site 1 and was replaced by the Aalaner as a fuel sled. This Berco served as a sled for science cargo and the ATM sled. The ATM sled (Zebowski style) sank in the snow due to low ground clearance. (6) The Aalaner sled proved once again to be a superb fuel sled. (1) The Aalaner sled proved to be an excellent, if not essential sled, carrying 50+ fuel drums in 2001-02 (40+ in 2002-03), 9 100 lb propane cylinders, and various other items. The ski design on this sled is well suited to oversnow transport. Aalaner axles have high ground clearance. Aalaner skis are shaped like floats (convex underside for flotation, convex upper side to shed snow) and white to minimize heating. Although satisfactory for lighter loads the Berco sleds have half the load capacity (~17,000 lbs Berco, ~40,000 lbs Aalaner), and significantly less flotation. The Aalaner consistently floated on the snow surface. FLOTATION, FLOTATION, FLOTATION. (2) Check all sleds before deploying to the field. The Berco sent to Byrd for the 2001-02 season was missing both of its front pulling chains (no doubt removed during transport and misplaced). The Aalaner sent to Byrd for the 2002-03 season, although greatly appreciated, was missing: lubrication for axles, one bolt in the hitch mount, and had severely scratched ski surfaces that increased drag, potentially leading to bogging down. (3) Retain the Polar Haven mounted on Berco 3 as a workshop and berthing space. More ideally replace the Polar Haven with another permanent shelter that provides a warm workspace and berthing for four people. The additional berthing will relieve the crowded berthing for nine in the Blue Room. The Polar Haven was a last minute addition to US ITASE in 2001-02 and proved to be extremely valuable. 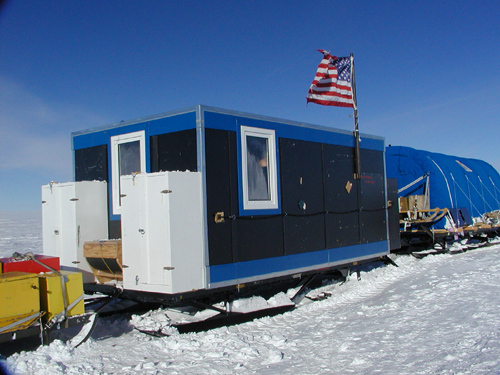 Unfortunately the Polar Haven used in 2001-02 was installed without a window (fortunately a last minute installation at Byrd offered one small window), and was covered with mylar and bubble wrap preventing radio transmission until fitted with an external antennae. (4) The Blue Room and kitchen shelters should be replaced with aluminum CONEX containers as originally requested. CONEX containers are: relatively light, fit into C130s deleting the necessity for construction in the field, more robust under rough transport than nailed structures, designed to be accepted by Berco sleds as indicated by mounts at Berco corners, easy to pack due to large end door, ideal structures for storage of over winter equipment, and can be packed at home institutions or in McMurdo similar to the system used by oceanographic vessels. (5) Sleds with low ground clearance should be avoided on intermediate (beg., US ITASE) and heavy traverses. (6) All heavy sleds should come with tie downs for cargo straps. We managed to produce tie downs using webbing taken from airdropped parachutes. Two snowmobiles were requested for 2002-03. Two were supplied. One was shipped back to McMurdo with a broken track system. The other came on the traverse, but was not of sufficient quality to sustain long trips. (1) The Alpine 2s appear to be too worn for remote parties. We had requested either Alpine 2s or Yamaha VK540s. (1) Quantity 100, 55gal drums of AN8 for the Challenger 55s to travel ~1300km each. During the 2000-2001 traverse fuel consumption was ~0.75km/gal. (an average of heavy loads and return light loads). The 2001-2002 traverse assumed 0.75 km/gal. plus ten extra drums. Using as a basis for fuel consumption the heavier loads towed in 2001-2002 and the need for small extra fuel supplies to do side trips an estimate of 0.6 km/gal. provided a greater margin of error for future fuel consumption estimates. Because most of the 2002-2003 traverse from Byrd to South Pole was uphill and we encountered significant travel issues on our first attempt to Site 1 we changed our fuel consumption estimate to 0.5 km/gal. The actual consumption was closer to 0 .6 to 0.65 km/gal allowing us to cache fuel for future activities. (2) Quantity 9, 55 gal drums of Mogas for one snowmobile and five generators. This estimate was based on 2001-02 estimates. Actual consumption was closer to 6 drums. (3) Quantity 12, 100lb propane cylinders for heating the Blue Room. Kitchen, and Polar Haven and for cooking. We might have used 12 propane cylinders except the temperatures encountered were far more moderate than expected. It was extremely hard to keep propane heaters operating so consumption was reduced. (4) Quantity 22 gallons of white gas were on board as back up for propane stoves but were not used. (5) Generators were used during 2002-2003 season for melting water, drilling, 24-hr on-site atmospheric chemistry measurements, and radar experiments. One Herman Nelson was available for thawing motors. (6) Solar and wind power systems were significantly improved this year. The wind power system operated efficiently for the first time since it was installed in 2000-01. However, the battery bank for the solar systems did not weather well over the winter. The kitchen 3000 watt power inverter failed necessitating transfer of the 1800 watt system from the Polar Haven. (7) US ITASE requested two small solar systems for the 2002-03 season. Parts were made available, but they had to be constructed in the field. Further the components were not always suitable to handling in the cold because of size, type, or placement. (1) Heating fuels that operate at low temperatures should be introduced for field use. (2) Battery banks for solar power arrays in the Blue Room and kitchen should not be left to over winter in the deep field. (3) Considerably more support should be given by Raytheon to the development and construction of solar and wind power systems. We utilized several small and large systems. While improving each year – the systems could be more fully and efficiently utilized. It is not clear how many C130 flights were dedicated to US ITASE this season since many of the flights to Byrd contained fuel and supplies for other teams. However, once the heavy vehicles and heavy sleds are in the field US ITASE should require no more than two C130 flights for put in, two for take out, and one to two for fuel emplacement. One Twin Otter flight came to US ITASE in 2002-2003 to transport essential science cargo that was inadvertently not placed on a C130 flight. Twin Otter close support was provided for the surface glaciology program. The tasking involved revisits to sites installed during earlier US ITASE seasons. The scheduling was convenient and the aircrew provided excellent support (in the air and helping with science work on site). Two LC-130 airdrops were dedicated to US ITASE in 2002-03. A total of 24 pallets (4 drums per pallet) were air dropped at four sites along the traverse route. The 109th ANG did a superb job of placing the fuel drops at sites planned for scientific activities. All drops landed on target. Five chutes did not deploy. No fuel loss was observed, although some pallets required extensive excavation with a Challenger 55 for recovery. Airdrops most definitely provide an excellent way to avoid carrying large amounts of fuel and burning fuel to carry fuel. All fuel drums either taken from Byrd or dropped along the traverse route were filled prior to deployment to within only ~8-10” of the barrel top. At most drop sites it took nearly one pallet of drums to top off four pallets. An AN8 fuel cache was placed by the traverse during the 2002-2003 season at one site to assist with Twin Otter flights required for resurvey of GPS installations: 6 full (AN8) barrels bermed on 6 empty barrels at 86 30’ 08.9” S, 107 59’ 26.1” W. 24 empty barrels were left at 83 32’ 09.48” S, 104 59’ 15.32” W to lighten the sled loads and allow forward progress. (1) Fuel drums should be filled to the specified 4” to improve fuel delivery efficiency. (2) Once US ITASE vehicles and sleds are fully deployed US ITASE can be supported by a maximum of six C130 flights per season or by Twin Otter and C130 airdrops. Continual change and exchange of sleds and vehicles, and construction of shelters that could be replaced by CONEX containers has necessitated considerably more flight allocation than necessary. (8) one Komatik for the ATM shelter – this sled was eventually mounted on a Berco because it too acted like a snow anchor. Special Note: Unfortunately Berco #5 was used for science equipment formerly on Komatiks and the ATM Komatik reducing dramatically the potential for retrograding empty fuel barrels. Some barrels were discarded of necessity en route (with the knowledge of the NSF Rep McMurdo). (1) Light sleds should be carefully selected for traverses in regions with soft or thick snow keeping in mind sufficient ground clearance and track separation relative to heavier sleds. 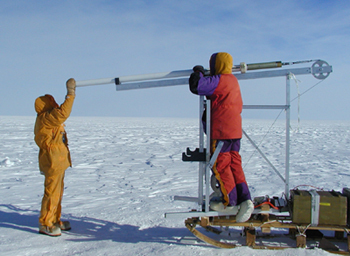 The primary drill used for the 2000–2003 seasons was the Icefield Instruments Eclipse 3’’ ice drill first used by US ITASE in 1999-2000. Overall performance was excellent with minor mechanical breakdowns. It offers notable logistic advantages that make it particularly useful for field traverse programs. It is lightweight and can be easily transported on a dedicated Maudheim sled, without complete disassembly. It takes a 3” diameter core and therefore requires fewer core boxes to transport and store the core than the standard 4” PICO drill. Eclipse ice core quality was excellent throughout all drilling depths making processing easier. ICDS supported valuable modifications to the Eclipse drill and provided a highly experienced driller. A new 2” ice core drill (ITASE) designed by Glacier Data was introduced in 2001–02 and modified for use in 2002-03. The ITASE drill was designed for and purchased by the University of Maine and utilized by several US ITASE projects. It was used in conjunction with the Eclipse to reduce time on site and served extremely well. (1) It is essential to have an experienced driller on US ITASE traverses. (2) The Eclipse drill control box and spare require weatherproofing to avoid wet circuitry problems. (3) The Eclipse drill requires a modified slip ring assembly on the sonde to avoid snow packing in this section and resultant slip ring failure induced drill spin that necessitates drill cable retermination. 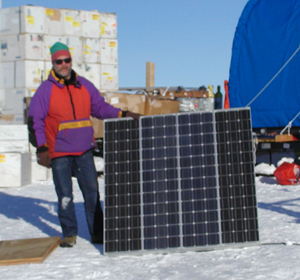 A crevasse detector was supplied and maintained by CRREL during the field season. No crevasses were detected en route. However, crevasses were seen 5–10 km off to the side of the route suggested by RADARSAT examination. The crevasse detector utilized a small computer screen that was extremely hard to see and continually monitor. Further it required a dedicated operator. The system should be fitted with an audio signal to warn the driver. The ITASE toilet is mounted on a Komatik, improving its durability and allowing it to second as an equipment sled. The Polar Pooper plowed through sastrugi slowing forward motion in 2002–03, but faired better than the other Komatiks because it was lightly loaded. Several sleeping bags issued to ITASE personnel were not cleaned prior to issue. US ITASE had one NSF issued Iridium phone, two Iridium phones provided by the Museum of Science (MOS) Boston, one Iridium provided by the University of Maine, 2 HF PRC 1099 HF radios, four VHF radios and, five VHF base stations. Daily communications were routinely accomplished with the Iridium. The two Iridium phones supplied by MOS were used for transmitting daily logs for the US ITASE outreach program. Because only one NSF Iridium was available for US ITASE we were issued a 2001-02 vintage NSF SIM card for one MOS phone expanding our communication capability. The University of Maine Iridium phone provided a data link for personal and business use. (1) Iridium phones should be considered routine tools for communication and safety. Ideally one phone should be issued per 2 people in each field party. During the US ITASE 2002-2003 field season the field team participated in several outreach activities. These included: a Wednesday night lecture in McMurdo, a Sunday night lecture at South Pole, news articles for the Antarctic Sun, biweekly live interviews with the Boston Museum of Science (1 November to mid Jan) and the media. US ITASE had a TEA assigned for the 2001-02 field season. However, the TEA was injured while in McMurdo and returned home. With the remaining funds US ITASE hired a school teacher (Peggy Lewis) who interacted with US ITASE remotely while remaining in Iowa. We were also fortunate in 2002-03 to have a former TEA (Betsy Youngman) join the team as a field tech. She maintained a TEA like involvement while conducting her regular ITASE science activities. Ann Zielinski maintained the link between US ITASE, MOS, and various other outreach activities from her office at the University of Maine. US ITASE was most fortunate this year to have three highly experienced, highly capable Raytheon personnel involved in the project. Lynn Peters returned to US ITASE this year to serve as camp manager and mechanic. Carl Hess joined US ITASE this year as mechanic. Andrea Isgro joined US ITASE this year as the first full time cook and as medical officer. There is no doubt at all that US ITASE owes an immense debt of gratitude to these three individuals for keeping us moving, comfortable, well fed, happy, and able to conduct our science. We would also like to thank all of the other Raytheon staff who were involved in US ITASE. Notably our POC Kirk Salveson. And, of course, thank you to the 109th New York Air National Guard for airdrops and flights.